I did not know there was a prayer(Seven Sorrows of Mary Rosary) for sinners. Until two months ago. I found it in a prayer book that my niece sent me from Taiwan. When I was reading it, surprised to see it says “Pray with “Seven Sorrows of Mary Rosary”. I’ve never known that there was such a kind of Rosary in my life. The prayer book did not carry any pictures. How would it look like? I was more interested in the Rosary then the prayer!! I went to the gift store at the Cathedral of Christ the Light in Oakland, Ca. Right away after lunch that day, There I found one. But very expensive. It costs $32! That was the only one they have. That was the end of the month. Like others! There barely any money left in my bank! 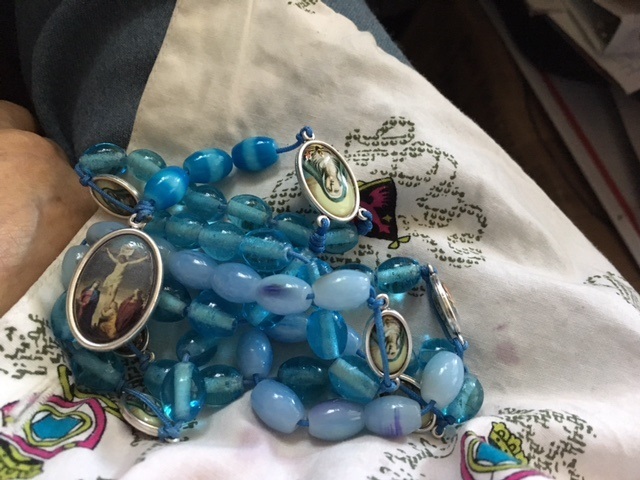 On my way home, I said to myself: “‘the difference between Rosary and the seven sorrows of Mary was the number of beads and seven sections instead of five decades. The Sorrowful Mary model instead of a Crucifix. I have some beads left over from the Rosary I made before. Only if I can find those models, I could save some money! 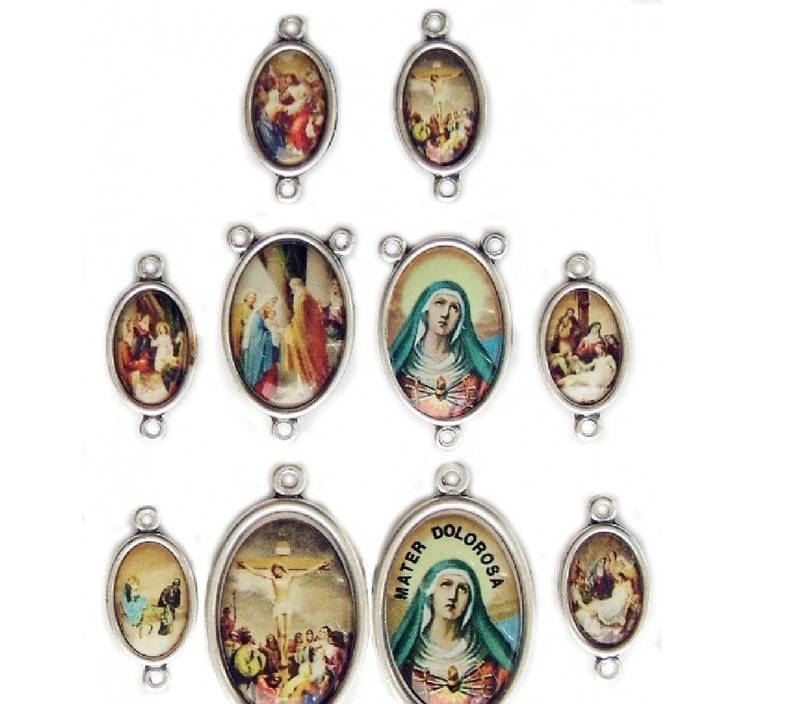 From the internet, I ordered three sets of Seven Sorrows of Mary Rosary. I found some cute beads. But only enough for two. I had spent enough money for models already. Instead of buying some beads. I picked up the same sides but different colored bead. I made a colorful one for myself. Who cares the color! As long as I don’t have to count my fingers while praying. God will listen the same! Those nice ones, One for my 2nd son in Taiwan. One for a friend in Taxes. Because I know they really pray! I asked them to pray with me for sinners include me every Friday!. In the early days, my mother grand the honor to name this bonsai “Yu Jei Bing Ching”. In Chinese, Yu Jie mains as pure as jade. Bing Ching means as clear as ice. The whole bonsai describes strict morality and behaviors, noble, eligant and integrity. 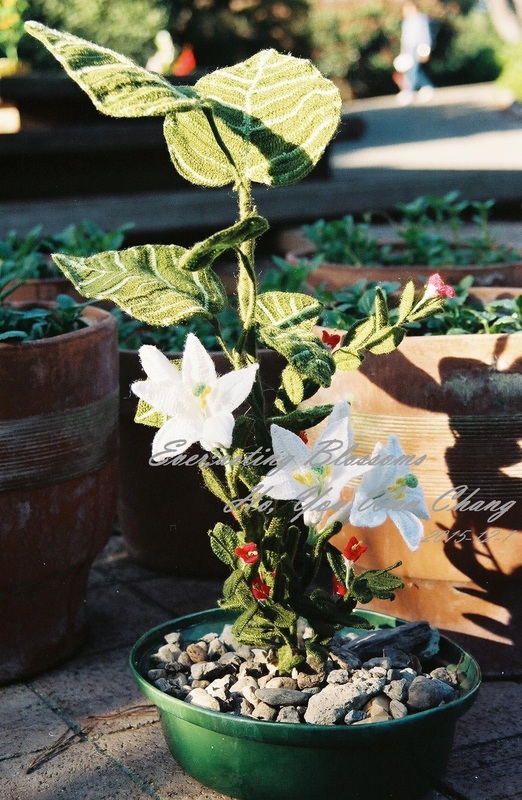 I named so because after my mother finished the arrangment of this bonsai, the lilies reminded me of Mary, mother of Jesus. The Rhodea Japonica looked like St. Joseph standing right next to her. Those little red flowers shows the motherly love to Mary and St. Joseph of my mother. I was deeply touch by it! What else could I name it!